From the Original Soundtrack recording. 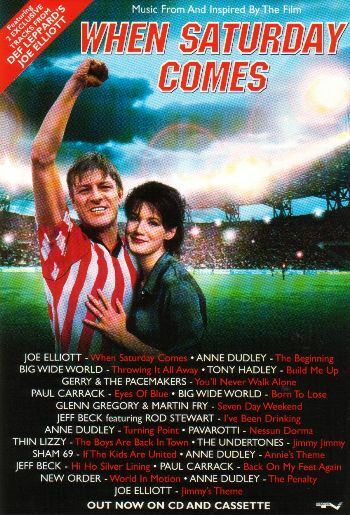 When Saturday Comes is a British film (1996) about two Sheffield, England soccer teams. Joe Elliott, an avid soccer fan, had a cameo role and contributed two songs to the soundtrack. The first song is the title track, with the lyrics below. The second song is a small instrumental titled "Jimmy's Theme". And see what I can do for you. I'd do anything you want me to. And I come ticking like a timebomb. And I come running like a marathon. Out here on this field of dreams. Nothing else matters to me. You got to wear your heart on your sleeve. You know I couldn't give y'any of this. There ain't no room for second best. D'you want to be the Blade. It's a feeling that you'll never know. You've got to fight it tooth and nail. Out here on this Battlefield.